“Flamenco can be compared to a love story, but if it was only that, it would not be even worth telling it. In this story joys and pains live together, and we all know what they are but without being able to find a word to define them, and yet that is not love. Flamenco is something that strokes you, that gives you pugnacy, it is the remote origin of the gipsy race...and we know that the gipsy is the best know, the deepest and the noblest human of Spain; the symbol of its customs, the keeper of the fire and the language of the Andalusian truth. All stories have a soundtrack, ours has a gloomy and enigmatic music. It is important to claim this because Flamenco is a music at times strange, that leaves you with no words, that is played softly and danced slowly. Listening to someone that can play it well is like listening to the silence, and the bodies that dance to it seem motionless. Flamenco is something dreadfully hard, it is a way of being, of living, of interpreting reality. It almost seems a love taken to the exasperation of the senses, where exagerating ends to be magnified reality in the purity of a gesture...Life, Love and Death, all enclosed in a void of passionate silence which lasts a moment, an instat that challenges eternity in the unintelligible reflexion of emotion. Entering the world of flamenco requires a starting point which cannot be omitted: Flamenco is an art. An art whose cradle is Andalusia and whose origin is the fusion of different cultures, that have been living together in perfect harmony through the centuries: the Arabian, the Jewish, the Christian and the Gipsy. Some authors claim that the path of Flamenco started in India and then expanded in Arabia, Greece and Rome to reach evetually the Iberic peninsula, taking with itself many small seeds of the various cultures. First evidencies go back to the end of the XVIII century. In this time flamenco existed only as singing expression; they used to sing without the company of the guitar, using at most some rudimentary rithmic supports, like some forms of body percussion: knocking on tables, clapping hands (palmas), or stamping feet (taconeo) or snapping fingers (pitos). Singing sounded like a lament with a strong oriental connotation, referable to the presence of the Arabians on the Iberic peninsula for a long time, especially in Andalusia, which was the last stronghold of the muslim rule in Spain. Flamenco, with its 3 components, singing, music and dancing, is part of the gipsy people, of their every-day life, of their occasions and circumstances both ritual and cerimonial, and purely entertaining. It was not born as a performance and, up to now, even though it has been broadly absorbed by the stage logics, it still keeps within the circle of family and friends – parties and gatherings – its nature of a true living language. 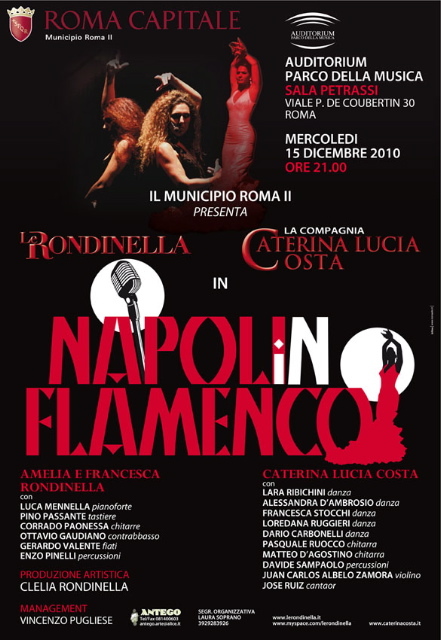 Copyright © 2004 - the 2008 material contained in the site is protected by copyright: the contents ( marks, witnesses, images, video, music or other) and all the code software, is of exclusive property of Caterina Lucia Costa or of the respective owners. It is not allowed to thirds party to copy, to modify, to resell or however to take advantage of the content of the site for trade without preventive authorization written from Caterina Lucia Costa.